Deuteria Beverages has pioneered the discovery and use of ETHANOL-D in alcoholic beverages to reduce the known detrimental effects of ethanol such as hangovers, cirrhosis of the liver, stomach cancer, throat cancer, and Asian Flush Syndrome. Deuteria Beverages was founded as a Nevada limited liability company by Anthony (Tony) W. Czarnik in 2009. The initial human proof-of-concept studies were completed by Tony. After ingesting a cocktail made with ETHANOL-D, Tony reported similar, desirable intoxicating effects as regular ethanol, but with less undesirable hangover effects (obviously biased). Based on this initial result, a patent application was filed August 21, 2009 and issued February 25, 2014 as US patent #8,658,236. Ethanol is the common ingredient of all alcoholic beverages including beer, wine, spirits, and liquors. Global sales of alcoholic beverages is over one trillion dollars. A summary of worldwide alcohol consumption is presented below. The detrimental effects of alcohol consumption include hangovers, cirrhosis of the liver, stomach cancer, and Asian Flush Syndrome. These effects are caused by the action of two enzymes, alcohol dehydrogenase and aldehyde dehydrogenase, on ethanol and the formation of an intermediate metabolite, acetaldehyde. By decreasing the formation of acetaldehyde, the detrimental effects of ethanol can be reduced. Deuteria Beverages discovered that the replacement of two hydrogens on ethanol with a naturally occurring isotope, deuterium, increases the chemical bond strength and reduces the enzymatic formation of acetaldehyde. 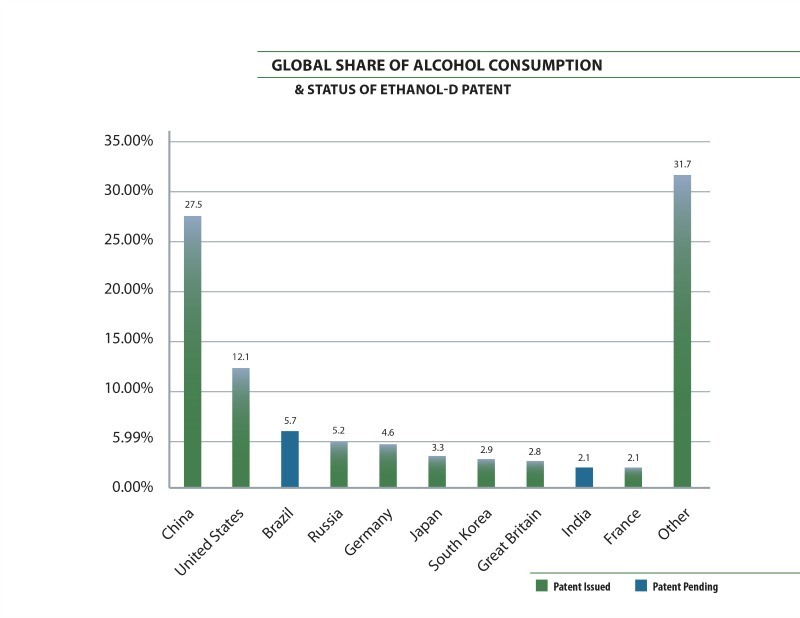 DBev has demonstrated the beneficial effects of Ethanol-D on reducing Asian Flush Syndrome, which represents a market of at least 4 Billion people. 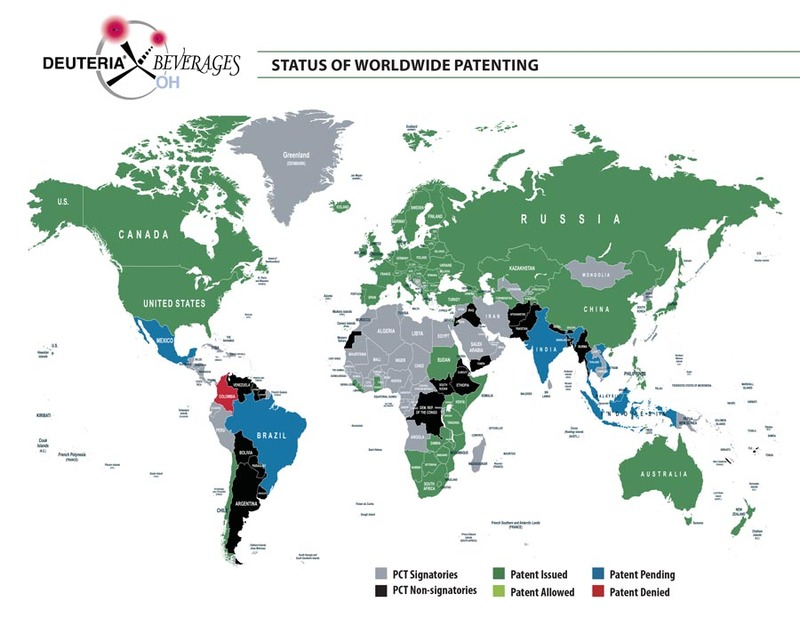 Patent protection for the use of ETHANOL-D in alcoholic beverages has been applied for in 27 jurisdictions worldwide. Nineteen patents have already been issued, 1 is allowed (not yet issued), 6 pending, and one abandoned.